Straight teeth are beautiful and provide a multitude of health benefits in conjunction with aesthetic improvement. Everyone should be able to enjoy the benefits of straight teeth, which include a more confident smile and easy oral home dental routines. Some avoid seeking orthodontic treatment despite their need, for fear of the aesthetic and lifestyle changes associated with metal braces. At The Dental Office at River House, we offer Invisalign clear aligners as the solution for discreet and effective orthodontic treatment. David P. Cote, DDS, and his team at our Arlington dental practice stand by Invisalign as the preferred method to straighten smiles. With the heap of benefits accompanied by this contemporary approach, it’s not difficult to see why Invisalign is a popular choice for both dentists and their patients. • Invisalign Go integration with the iTero digital chairside monitor allows us to show patients exactly what to expect as they progress through their treatments. This software shows patients their projected progress with individualized 3D images. • Invisalign Teen to ensure your teen completes their course without the exorbitant replacement costs of lost aligners. • Invisalign Express is created for patients whose crowding or spacing problems can be corrected with fewer steps than average Invisalign. In increments of 10 or 5 stages, Invisalign Express creates beautifully straight smiles in less time than ever. Dr. Cote utilizes contemporary acceleration orthodontics enhancement, Propel® Orthodontics to streamline his patients’ Invisalign experience. The Propel system works with our patients’ biology to speed up their orthodontic treatment by 50%. Using vibration, Propel stimulates bone remodeling. This allows the teeth to shift as quickly and painlessly as physically possible. The vibration creates microscopic perforations within the alveolar bone, the part of the jaw that houses the teeth roots. It’s not uncommon for patients to avoid traditional orthodontic treatment for personal reasons. Some find the prospect of wearing bulky metal hardware unacceptable, despite the immense benefit of the results. Many of the trepidations felt by potential orthodontic patients are mitigated by using the nearly invisible Invisalign orthodontic method. Choose Invisalign from Dr. Cote and discretely straighten your teeth while maintaining the look of your natural smile. Patients can remove their aligners at will, to take photos or attend important events. Patients can expect a straighter smile in months provided the retainers are worn on an average of 22 hours per day. Our Invisalign patients do not have to alter their diets. The aligners are removed before eating, which allows patients to eat their favorite foods as well as keep their retainers clean and undamaged. 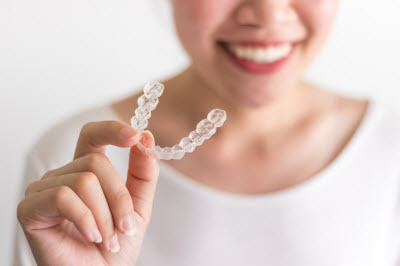 As a preferred provider of all forms of the Invisalign method, The Dental Office at River House can help you reach your optimal oral health goals. With his advanced technologies like Invisalign Go and Propel Orthodontics, Dr. Cote is Arlington’s choice for beautiful, straight smiles. Call us today to schedule an appointment!